Posted on April 7, 2019 by gayle. 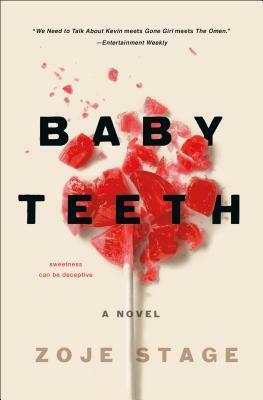 This entry was posted in Fiction and tagged baby teeth, thriller, zoje stage. Bookmark the permalink. I read this, too, and I agree with you. I am are most stopped reading the book after the first 50 pages because it was so aggravating. I finished the book, but I don’t remember why. I agree with you as well. I am one of the readers who compared this with “Kevin” — one of my favorite novels of all time — and certainly Zoje Stage is no Lionel Shriver, but no one is Lionel Shriver. What this did have that “Kevin” didn’t was occasional glimpses into the perspective of the child, which I found compelling. Although there was brief reference to “No, she doesn’t have autism,” we all know nonverbal children like this and wonder what it’s like inside their minds, and Stage attempted to give us a brief yet plausible view of what that might be, which I appreciated. Also the author brought in a couple of other interesting aspects: Suzette’s physical illness, which as Nicole said on your podcast was almost like another character in the story; and, less important but still original, Swedish culture and some of the aspects of being married to a European immigrant. I have not been recommending this one; overall it’s disturbing and inconclusive and, like you, I don’t feel any better off for having read it, but I still appreciate that it offers quite a lot of food for thought. Fair enough – there is definitely enough in the book to merit a discussion. I just felt very off when I finished it – like I was relieved to be done and on my way.